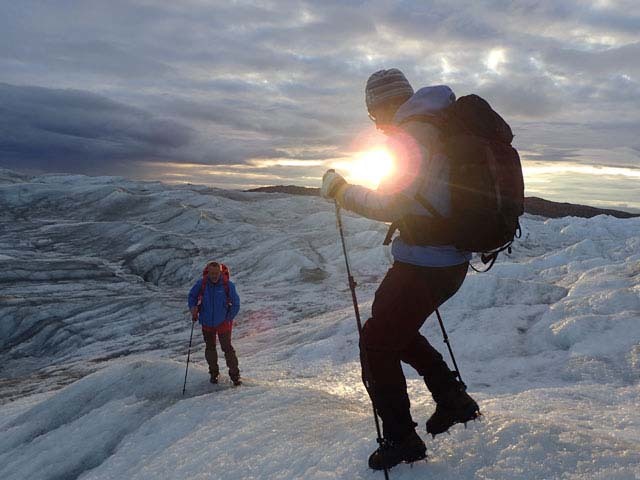 We do not currently offer experiences in Greenland (though we offer plenty of other options for outdoor activities! ), but Bob from Nature Travels visited in September 2017 to research possible future additions to our portfolio. There are some things you just assume you’ll go through your life without ever doing. 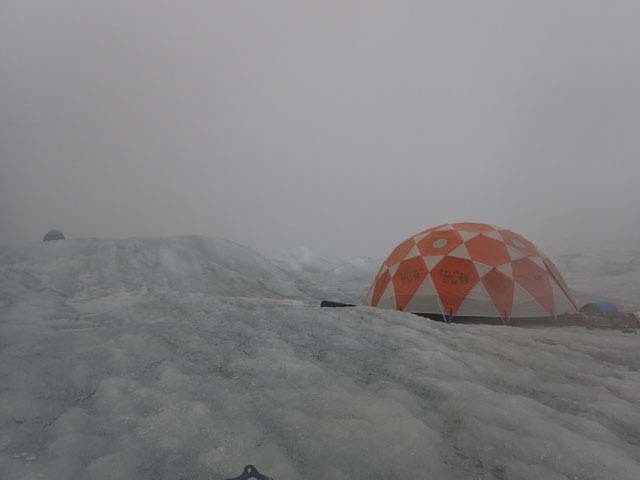 So finding myself waking up in a tent on the Greenland ice sheet one morning in September was a definite (to quote a well-known song) “I wasn’t expecting that” moment. I’d never been to Greenland before. It had always been lurking there in the back of mymind as a place I’d love to go, but actually getting there always seemed an unreal possibility. But sure enough, like many of the amazing things I’ve had the chance to experience during my 12 years running Nature Travels, the opportunity presented itself eventually. Camp. Photo: Bob Carter Nature Travels. We don’t offer Greenland as a destination at the moment, but I was here to research possibilities for the future, and as Air Greenland’s single large plane (an Airbus A330) banked over the tiny settlement of Kangerlussuaq – pronounced [ganger’ slu-suark] – and came in to land, it was very clear we were not in Kansas anymore, Toto. Sunset ice cap explorers. Photo: Nature Travels. Kangerlussuaq is an ex-US military base built in 1941 as a supply point for the Distant Early Warning Line network and handed over to Greenlandic control for the nominal sum of $1 in 1992, on the condition, as rumour has it, that the Americans didn’t have to clean up the mess they’d made. Kangerlussuaq was chosen as a landing site because of the area’s more stable weather compared to the turbulent coast, being located inland at the end of a long fjord and so also serviceable by ship. Today, it’s one of only two places in Greenland where a large commercial plane can land, so passengers arriving here change to smaller planes (usually Dash 8 turboprops) to reach the towns along the coast such as Sisimiut and the capital, Nuuk. 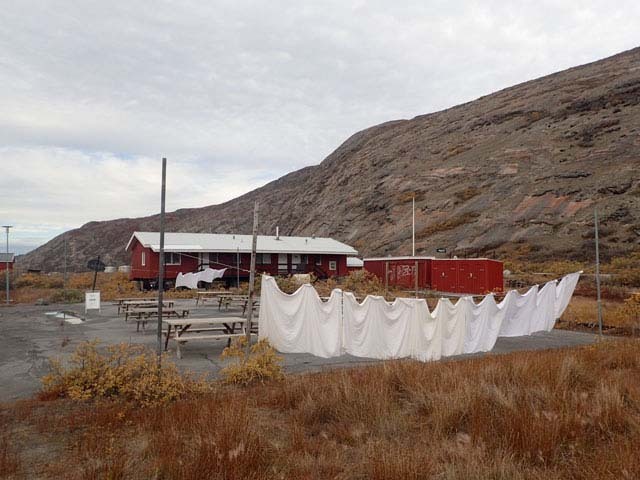 At first glance, Kangerlussuaq is not an easy place to love – its architecture is, to put it nicely, brutally functional, made up mostly of austere, prefabricated accommodation containers that make no secret of their militaristic past. But spend a few days here and you may find, as I did, that you’re utterly charmed by the place. The dry air is great for laundry! Photo: Nature Travels. With a population of just 500, you can’t afford to be lacking in social skills when you live in a community as small and isolated as this, and the people we met were invariably warm, funny and welcoming. 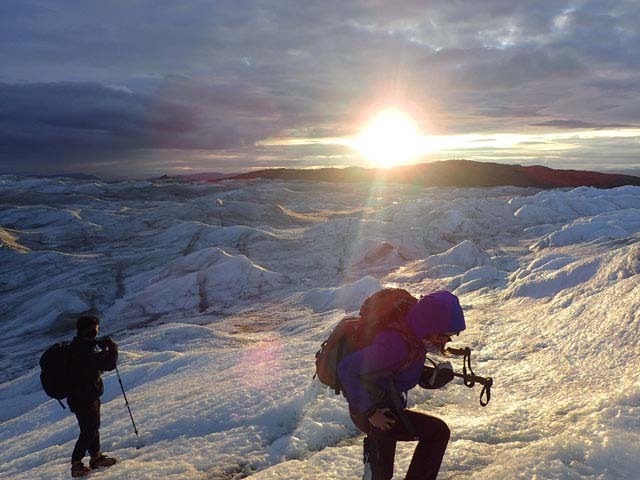 Kangerlussuaq itself may be distinctly unattractive, but its setting is absolutely stunning – surrounded by complete wilderness, with free-roaming musk ox and reindeer just outside town and the mystery and grandeur of the vast Greenland ice sheet beginning just over the horizon. End of the road. Photo: Nature Travels. It was the ice sheet I was here in part to see, and the prospect of going camping on it for the night had me seriously excited. On our way! Photo: Nature Travels. The ice cap is reached by a bouncy hour or so along Greenland’s longest “road” (a mere 30km), originally constructed at enormous expense by a car manufacturer to transport prototype cars to the ice sheet for testing in extreme conditions, but now fallen somewhat into disrepair. One thing that’s immediately apparent when you get to the end of the road is that the ice sheet is not where it used to be. When the road was built back in the 90s, it led right up to the white stuff, but since then the ice has retreated considerably and there are now a few hundred metres of gravelly moraine to struggle over before you can put on your crampons. Time for tea. Photo: Nature Travels. 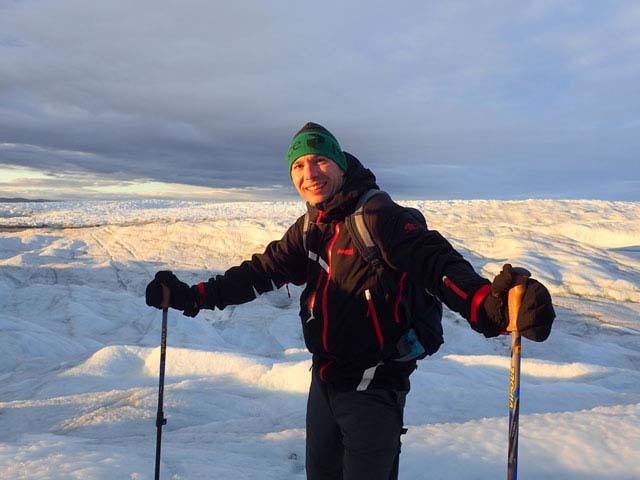 For many an extreme adventurer, the crossing of the Greenland ice sheet will be high on their list of “must-do” challenges. But that’s very serious stuff indeed, taking 3-4 weeks and requiring pulling all your own equipment on a pulk that will weigh around 80kg at the start of the trip. The obligatory “proof I was here” photo. Photo: Nature Travels. 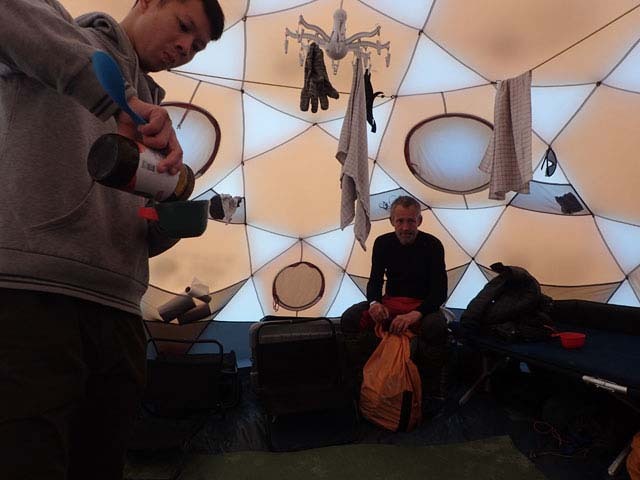 Our ambitions were far more modest – we had just one night to experience the ice sheet, walking just a few km and with our pulks weighing more like 10kg. But while it may have been far more accessible in terms of level of challenge, there was no denying the exhilaration of the experience itself. 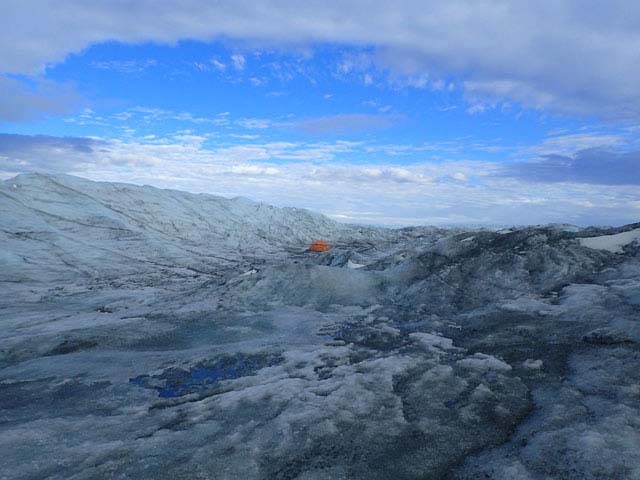 We were going camping on the Greenland ice cap – how cool is that? 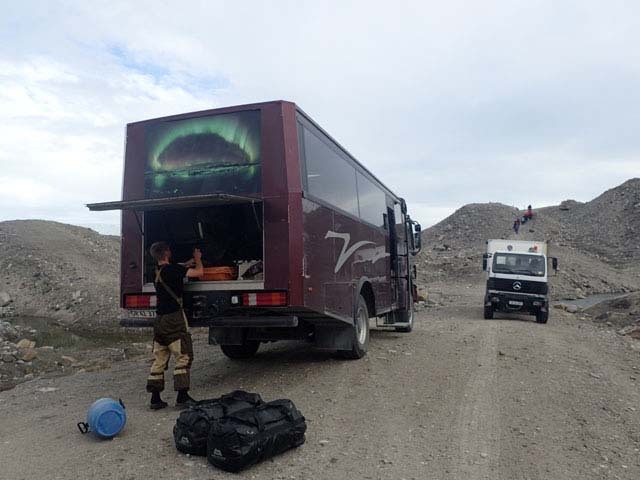 Base camp comes into sight. Photo: Nature Travels. 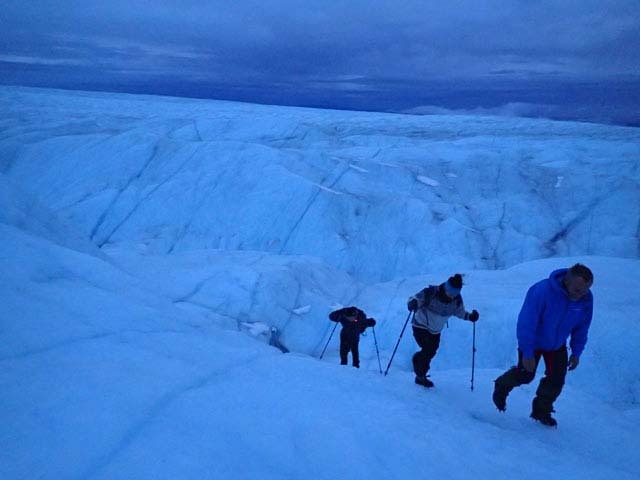 We strapped on our crampons, harnessed our pulks and set off across the ice. 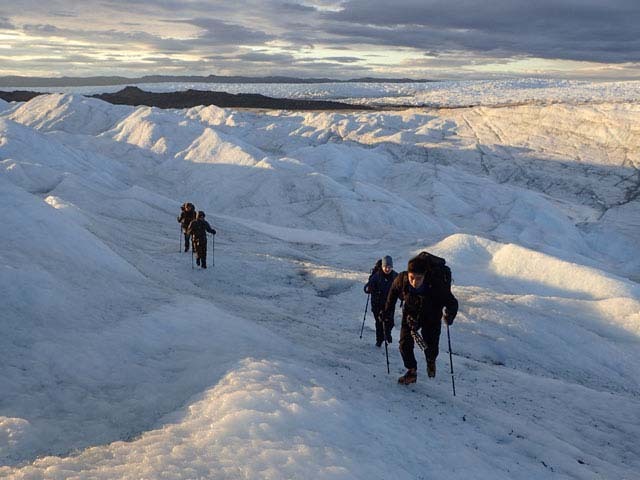 Here we were, trekking on the Greenland ice sheet, 660,000 square miles of ice up to 2 miles thick in places and covering 80% of Greenland’s surface! Which way up does this thing go? Photo: Bob Carter Nature Travels. 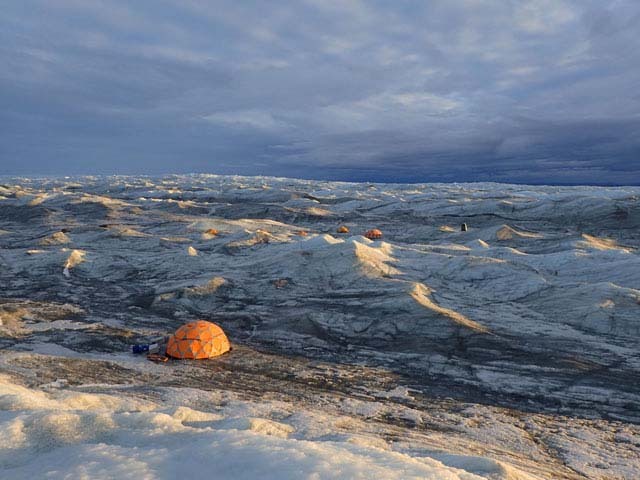 Here at the edges, the ice is jagged and uneven, but it took just a short while to reach the camp, which is located close enough to the edge of the ice sheet to be easy to reach, but far enough in that you feel properly immersed in the adventure. Loo with a view. Photo: Bob Carter Nature Travels. 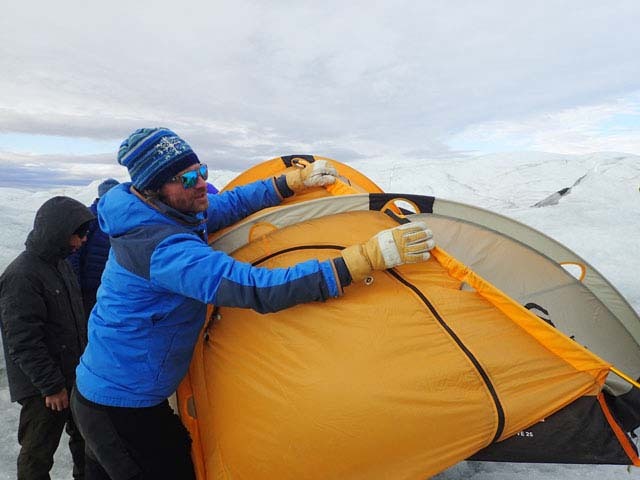 The base camp tent is set up “permanently” (in practice it needs to be moved every few days through the summer as the ice melts), but we were carrying our individual tents and also a toilet tent, which we would set up on arrival. Pitching camp. Photo: Bob Carter Nature Travels. 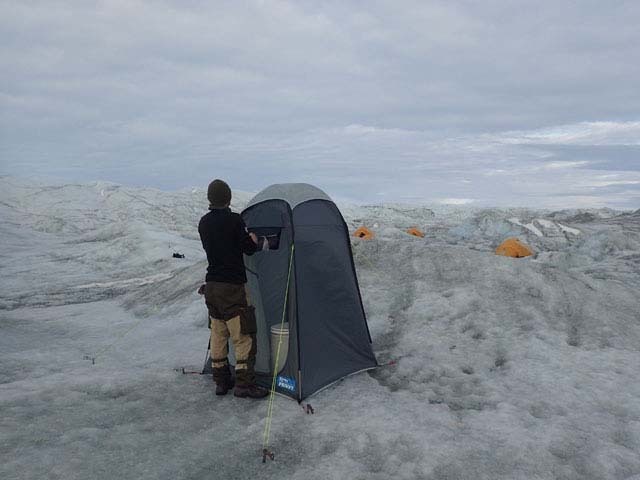 We erected the tents, using ice screws to anchor them onto the ice, and after a quick tea-break, it was time to go exploring. 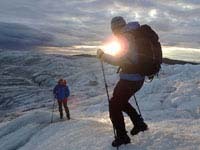 Crampon technique training! Photo: Nature Travels. Being September, the daylight hours were starting to shorten, but we had plenty of time to head deeper into the wilderness, discovering beautiful crevasses, graceful sweeping sculptures of melting ice and gurgling streams rushing thrillingly along just beneath our feet, all magically illuminated by the fading rays of the evening sun. Getting dark on the ice cap. Photo: Bob Carter Nature Travels. We covered a fair distance (or so it felt) and it was night by the time we made our way back to the camp, giving an added dimension to the trip by being out hiking in the dark. Dinner was a jovial and sociable affair, huddled together in the welcoming warmth of the base camp tent, but one by one around the circle, heads began to nod and eyelids droop, and it was time for bed. I slept well, my dreams punctuated by the heavy pitter-patter of rain on the tent (this was autumn after all) and we awoke to a changed world. Where’s the world gone? Photo: Nature Travels. Gone were the far-reaching views and clear skies of the day before, to be replaced by an enveloping fog that turned everything white and made the rest of the world seem even further away. 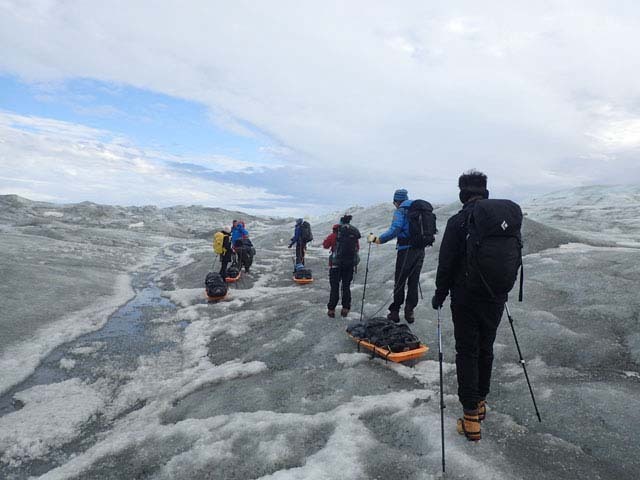 Ice cap trekking! Photo: Nature Travels. All too soon our adventure had come to an end, and it was time to break camp for the short trek back to the truck. 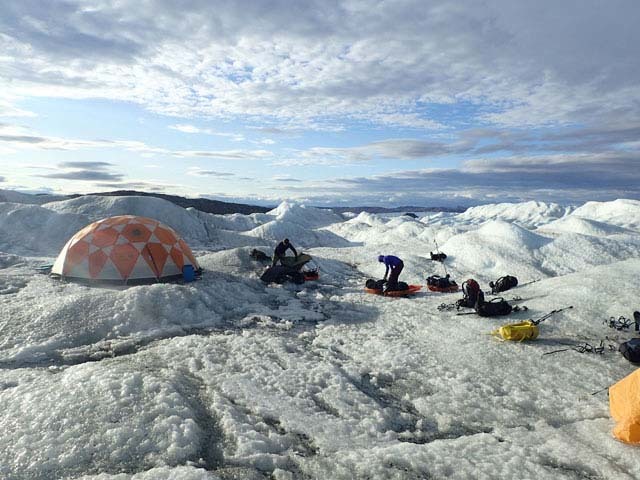 It had been just a taster of expedition life on the ice sheet, but an authentic one. I was reminded of a night I’d spent camping in the desert once on a trip to Morocco – my expectations then had been low, anticipating a cheesy tourist-trail excursion behind the sand dunes – but I’d been delighted to find that the tour had made us feel like we were properly out in the desert, going far enough into the wilderness that we had a real sense of isolation. So it was with our night on the ice cap (which is also a desert, albeit a very different kind) – accessible to most, yes, but a real adventure nonetheless. I experienced many other wonderful things during my trip to Greenland, but most of all I’ll miss the funny little metal boxes of Kangerlussuaq and the awe-inspiring horizons of the ice cap. Next stop full cross-sheet expedition (or maybe not). ← Why Use a Dry Bag?